A veteran CRS officer has revealed the extent of police violence towards refugees in northern France. The 40-year-old riot police officer – who wishes to remain anonymous – has worked in the ‘Jungles’ of Nord Pas de Calais for over 15 years. Speaking to Haydée Sabéran from Ebdo Journal in France, the CRS officer said: “Oh, I have destroyed many encampments, I have emptied canisters of tear gas to contaminate people’s sleeping bags… In Calais I follow orders and I don’t think. … I [have] colleagues who set tents on fire so badly that the fire brigade had to be called. These revelations raise questions about the £45 million the British government has this week promised to provide for French border security in Calais. A Refugee Rights Data Project report, “Twelve Months On”, released in October last year, found that 91.8% of refugees in Calais had experienced police violence. Though charities working on the ground in Calais have reported the police brutality refugees face for years, this is the first time a CRS officer has gone on record to reveal the extent of the violence. For fifteen years this forty year old has been intervening in the ‘jungles’ of the North of France and the Nord Pas de Calais area. He wishes to remain anonymous to recount his everyday life. I’ve been going to Calais for fifteen years. I’ve known Sangatte, makeshift camps, the jungle, and today the post-jungle era. 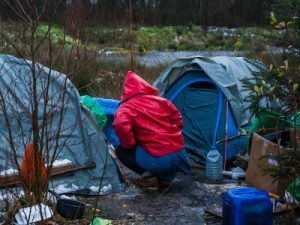 At the moment there are no actual shacks, only small tarps hidden as well as possible, because they know that if we find them we’ll kick them out. 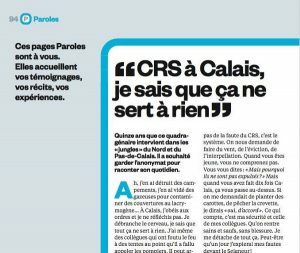 It’s not the CRS’s fault, it’s the system’s. We are asked to look busy, to evict people, to arrest them. When you are young you don’t understand: you ask yourself ‘Why aren’t they being deported? But once you’ve been to Calais ten times, all of this starts to go right over your head. If someone asked me to plant carrots, or go shrimp fishing I would say ‘yes, sure’. What’s important is my security and that of my colleagues. That we come home at the end of the day, safe and sound and without any injuries. I detach myself from the all of this. Maybe one day I’ll confess my sins to the Lord! All of this is very expensive, it costs us millions. For example, every time we come here on a mission, we stay in family resorts or hotels for a month. But when we need more people on the ground, like during the dismantling of the jungle in 2016, some of us had to sleep at a hotel at the Bay of the Somme – an hour and a half drive from Calais. I wonder if you understand just how mad this all is. Migrants keep coming to Calais to try and cross into England. While this is happening, the port and the Eurotunnel are becoming harder and harder to access. I have visited the security control installations at the port – it’s like Star Trek up there. First of all, there’s a visual inspection carried out by lorry specialists able to detect secret compartments and false floors. Then there’s a CO2 detector to check whether anyone is breathing, and then there’s the scanner, a big machine that takes some sort of x-ray of the truck. It’s an insane system from start to finish. They also have a heartbeat detector: they put what look like battery jump-starters on two parts of the lorry, and see the results on their screen straight away. They asked me to test it by stepping into the truck, and straight away I could see my heartbeats appearing on the screen. All around the area there are cameras, there’s barbed wire and security patrols. It’s a perpetual race to top security. One thing’s for sure – this generates jobs alright! But because it is harder and harder to cross, ‘jobs’ are created for other people as well. People from Calais are getting involved in mafia systems. Fishermen and people on tourist ships too are crossing that line. When migrants try to stop trucks by putting tree branches, trollies, tyres, and blocs of cement on the road, or by throwing rocks at windshields, we chase them with tear gas grenades. We use night-vision goggles and try to keep the migrants as far away from us as possible. When we’re outnumbered we don’t leave the vehicle, we just throw the gas from our windows. The migrants are determined, in a state of ultimate distress, but 90% of the time they move on without us needing to force them to. We do need to be on our guard though. Some smugglers take extreme risks because of the high sums of money at stake. Early January, one of them charged a CRS group with his car at full speed. He got two years in jail. But let me tell you, I have a harsh vision of all of this. If war broke out in France I would stay and fight, even with my family here. I have empathy for the migrants because of the travel conditions, that’s true, but at the end of the day I don’t have a lot of respect for them. I think they are cowards who refuse to die for their country. I have never had a conversation with a migrant. It’s been years since I’ve seen one from less than ten meters away. Testimony written down by Haydée Sabéran. The full article is available in ebdo, and is not yet available online.